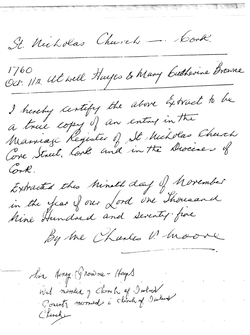 On the 12/11/1782 at the age of 21, Henry was made a Freeman of Cork City because of his family connections. By1790, Henry was elected as a Sheriff of Cork City, again with his father's help and family connections. As one of the two Sheriffs, Henry was asked to welcome the Lord Lieutenant, the Earl of Westmorland who at that time was making a tour of southern Ireland. The position of the Lord Lieutenant in Ireland was equivalent to that of a Viceroy, a position second only to the king in the country. John Fane went on and made a career for himself in politics, eventually becoming the King's representative in Ireland as the Lord Lieutenant, a position well suited for him. eighteen years old three masted, square-rigged, 387-ton ship, contracted to sail in the Spring of 1791 with the third convict fleet from England to Port Jackson, She was small, only 112 feet in length and 30 feet in width, with the height between her three decks just five feet three inches. Her captain Richard Owen was well chosen by the owners of the 'Queen' as were his four officers, a surgeon, two carpenters, a cooper, a cook and fifteen crewmen. To ensure the convicts fair treatment, the Navy Board was represented by Lieutenant Samuel Blow who joined the ship in Portsmouth , with Ensign William Cummings, a drummer and twenty five soldiers of the New South Wales Corps on the way to take up garrison duty in Sydney. But before the 'Queen' could join up with the third fleet, she was ordered to sail to Cork to collect more convicts, and be victualled there for the eight month journey to Sydney. She was also permitted to remain in Cork for no longer than fifteen days. The convicts to make the journey, were selected from 24 different counties in Ireland. The Dublin newspaper ‘The Freeman’s Journal’ of the 26th February 1791 carried the news that “the jailer of Limerick set off for Cork with a number of prisoners, where a large transport is preparing to carry all the convicts in the Kingdom to Botany Bay.’ The ‘Queen’ arrived in Cork on the 5th March and by the 12th of March 1791,had taken in its complement of convicts, 133 male and 22 female convicts, four of them with young children. The transfer was completed long before the fifteen stipulated days. In the meantime Captain Owen and Lieutenant Samuel Blow had left for Cork to meet with various merchants to purchase food and clothing for the long journey to Sydney. 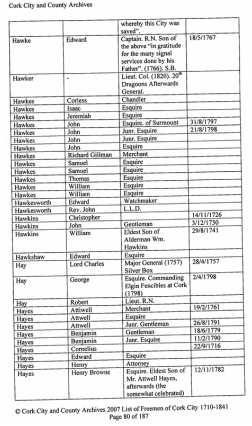 Once completed the Lieutenant was to return to the ship and acknowledge that the convicts were safe on board the ‘Queen’ and present Cork's Lord Mayor Richard Harris with a list of the convicts names and particulars. The Lieutenant in fact he had not returned to the ship nor could he be found after he had accompanied Captain Owen to Cork city to meet with Lord Mayor Harris, Sheriff Charles Ferguson and Sheriff Sir Henry Browne Hayes. It appeared that Captain Owen found a way to shake off lieutenant Blow. The young Lieutenant faced with a dreary eight month’s journey on a small convict transport was probably desperate to have one more fling before he sailed and Captain Owen offered him that chance. He assured the Lieutenant that he was not needed to oversee the purchase of supplies in Cork and why not spend the time instead having a good time. . Blow agreed and seized the moment. For the next month he could not be found. As it was, the Captain went to Cork and purchased poor quality food cheaply for the journey, and charged the Navy the maximum he thought he could get away with. Poor quality food costs far less than the same higher quality for which the Navy was expected to pay and with the undeclared savings, the Captain purchased extra merchandise for himself to sell in Sydney at a profit. As it was the Lieutenant failed to surface until the 11th April 1791. During that time the ship was forced to wait until Lieutenant Blow had completed the essential paper work in duplicate, listing names, ages, crimes committed, marital status, religion, literacy, occupation and the number of years, each convict had to serve. Captain Owen in the meantime, found himself in trouble with the officers and soldiers on board the 'Queen' who had to share the same poor quality food with the convicts. The soldiers found the food so disgusting that they complained to their superior officers. As long as the ‘Queen’ remained at anchor in Cork harbour, the Captain risked inspection and so he prepared to sail on the 7th April with or without Lieutenant Blow being there. Sir Henry could do nothing about that. But as it was Lieutenant Blow turned up a little worse for wear and was then forced to quickly make up the list and hand Sir Henry a copy for the Lord Mayor Harris. He failed to make a duplicate copy for the Sydney authorities. The ‘Queen’ left the Cove of Cork on the 11th April 1791, one month after it had taken on the convicts and two weeks after it should have sailed. When the 'Queen' docked in at Port Jackson on 26th September 1791, it did so without the most important list. The authorities lacked the information about the number of years each convict had to serve. In fact that information did not arrive until eight years later in 1799 when the authorities received a copy of Blow’s original indent. Fifteen of the convicts, who had been sentenced to seven years prison, had in effect served two extra years of their sentence, thanks to Lieutenant Blow’s carelessness. Sir Henry was blameless; the irony of his involvement in this historic foul up was revealed only when Sir Henry Brown Hayes himself was transported to New South Wales for abducting an heiress. When the ‘Queen’ docked , it was found that seven prisoners had died en route. The surviving convicts were in such poor physical condition that a magisterial inquiry was ordered. It revealed that the second mate who was responsible for issuing the rations, had ordered that the leaden weights should be scraped in order to make them lighter; consequently the 4lb weight was found to be six ounces under-weight, and the 2lb one almost 3 ounces likewise. He had also used 3 lb and 4 lb weights instead of 4 lb and 5 lb ones, and short rations of meat and fish were constantly given, causing the cook great difficulty in providing the different messes with even moderately adequate supplies. It was apparent that the agent, Lieut. Blow, did not supervise the ration issues, and when the prisoners decided to make a complaint to the guard commander he referred them to the agent Lieutenant Blow. Finally the guard commander approached the lieutenant with the prisoners’ grievances, but he replied, ‘My dear fellow, what can I do?’ During the inquiry the bench of magistrates, which included Capt. David Collins from the King’s County in Ireland, found that the rations contracted for had not been supplied, and that ‘It appeared beyond a doubt, that great abuses had been practised in the issuing of the provision.’ But it would seem that no disciplinary action was initiated against the contractors or the ships’ officers, though Lieutenant Blow may have been reprimanded. So the first transport of Irish convicts to New South Wales proved to be a monumental stuff up. The complete documents listing the convicts, their misdemeanours and their length of sentence, for some that information arrived in Sydney ten years too late.